Heat oven to 375F. Grease 12 regular size muffin cups with cooking spray. Remove dough from can; press to 8x18 inch rectangle. Cut dough evenly into 12 squares. 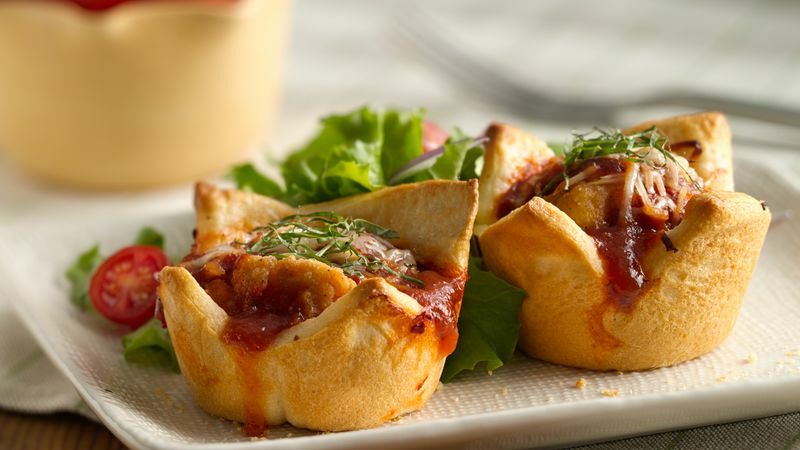 Press dough squares into muffin cups. Microwave chicken pieces on microwavable plate 1 minute on High. Place chicken pieces in muffin cups; top each with 2 tablespoons sauce. Sprinkle with cheese. Bake 15 to 18 minutes of until golden brown. Top with shredded fresh basil for a flavorful variation.